For the third installment in this year’s Fall and Film series, I decided to go with two categories that not only provide alliteration for my title, but also have deep roots in the history of horror films. The silent film vis-à-vis the horror genre should be an obvious relationship. Beginning in the early history of cinema, scary movies were born out of the silent era. 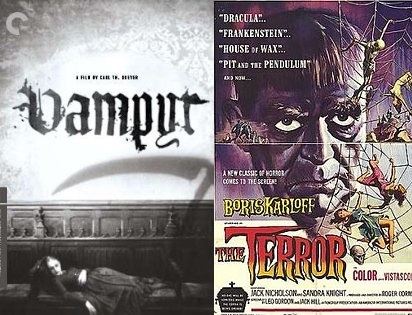 Specifically, the German productions of the 1920s, many done in the style of German Expressionism, provided the groundwork for the aesthetic of horror and Gothic films for decades to follow. Schlock, a Yiddish work for trash, also holds a significant spot in the horror history. The horror genre in particular appears to be susceptible to inferior quality films. Likely originating from the fact that audiences, especially at the drive-in, would flock to see anything scary, studios have continually spent time and resources in cranking out low-budget scare fare. Honestly, if you go into a schlocky movie with an open mind and the understanding of what you are about to watch, bad film watching becomes an enjoyable and entertaining experience. This is especially true in a group setting. So, for this week, I have chosen one well-known schlock-tacular from the 1960s and a perhaps lesser-known silent classic. Enjoy. If you told someone that a Francis Ford Coppola movie starring Jack Nicholson was coming soon, most moviegoers would pay attention. Add to that the horror acting legend Boris Karloff and the well-known Grindhouse era director Jack Hill, and you would have a bizarre, but star-driven event. The Terror could have been just that, as it includes all these individuals. Of course, the main person to include is also Roger Corman, the king of the B movies. Jack Nicholson stars as an officer in the French army (thankfully, he does not even attempt a French accent) who wakes up on a beach around the time of the end of the Napoleonic Wars. He encounters a baron, a witch, a butler… and that is about it. The Terror is a film that consists of roughly 75% people walking around in dark corridors and 25% of someone explaining a new and often absurd plot point. The real interesting fact behind this film is how it came about. Roger Corman had wrapped principle photography on The Raven, with Boris Karloff as the star. 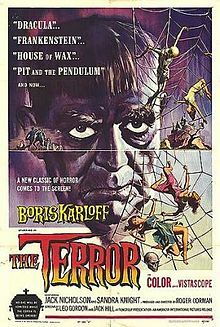 Because he had three days left in the schedule to film before the set (an old castle) was to be torn down, Corman decided he did not want to waste time or money, so began shooting The Terror, essentially, without a script. Writing and filming at the same time, with three individuals credited as writers and five people (most uncredited) in the director’s chair, the result is an absolute mess. In terms of B movies, it is not the worst one that I have seen… far from it. The movie’s biggest downfall is its utterly sluggish pace and nonsensical plot developments. To clarify, when I state that the film is slow, I do not mean it takes its time to build suspense á la Alien, but most of the shots of either Jack Nicholson or Boris Karloff wandering around (and believe me, there are plenty of them) drag on for far too long. In addition, the end “twist” is utter insanity. Without going into the plot details too much, it is the equivalent of discovering at the end of Return of the Jedi that Darth Vader was in fact the Emperor, and the Emperor was actually Darth Vader. If you are in the mood for a laughably bad time or just interested in seeing a young Jack Nicholoson, then check out The Terror. It is in the public domain, so feel free to YouTube it. I should start this by prefacing that there is a misnomer in my description. This film is in fact, NOT a silent movie. It is an early example of a talkie, perhaps one of the first horror talkies out of Germany. I decided to place it under the silent category anyway because, like many early talkies, the style of shooting and acting is still in the mode of a silent movie. Compounding that is the fact that the film contains very little dialogue or sounds pertinent to the story, going as far as using intertitle cards to explain plot points. Therefore, for my purposes, it is a silent movie. This is a vampire film unlike any other. It creates a great, foreboding atmosphere and includes some great visuals using in-camera tricks. Rather than focus on Dracula or even a charming figure, the film takes a classic approach to vampires, viewing them more as demons that possess the living. Some of the usual tropes, such as the biting of the neck, are included. The story is somewhat of a weak point in the film, as director Carl Dreyer clearly focused his energies on atmosphere and visuals over plot. In terms of story, and without giving too much away, the film has the usual elements of vampire stories, such as the traveler in a strange land, the doctor, etc., but Vampyr succeeds in changing the outcome of these now tired clichés. In terms of viewing, this one has been given the Criterion treatment. However, I was not able to check that edition out at the time of this writing. Several versions are available on YouTube, but I would watch one with the original soundtrack intact. There you have this week’s pair of films. I certainly hope you find the pleasure in watching The Terror, a less than stellar movie, perhaps finding your own source of amusement from the experience. 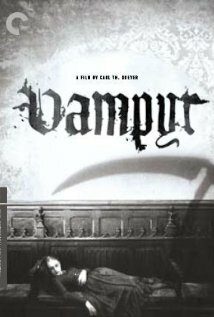 If you are new to silent films or have already begun watching them, certainly give Vampyr a go as it provides a welcome addition to the European silent horror classics. Stay tuned next Friday for the next installment of Fall and Film. Thank you for reading. This entry was posted in Movies and tagged Fall and Film, German Expressionism, Horror, Horror Films, Horror Movies, Jack Nicholson, Roger Corman, Schlock, Silent Movies, The Terror, Vampyr. Bookmark the permalink.